The QBE Foundation, the charitable arm of Australia’s largest global insurer, has donated $10,000 to the GO Foundation in support of their work championing Indigenous education and mission to expand their scholarship program. 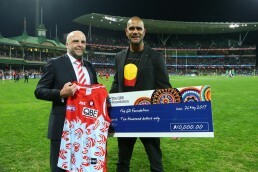 GO founders and Swans greats Adam Goodes and Michael O’Loughlin were presented with the donation at the SCG on Friday 26 May following the Swans Marn Grook match which formed part of the Sir Douglas Nicholls Indigenous round. QBE Foundation Chairperson Sally Kincaid said the donation was part of QBE’s mission to make a real difference to the communities it operates within and was another example of the strong relationship QBE maintains with GO and the Swans community. “We strive to be the insurer that builds the strongest relationships with customers of all backgrounds and cultures and, as one of Australia’s largest insurers of Indigenous communities, we’ve long been committed supporting and celebrating Indigenous Australians”, Kincaid said. Co-Founder and Non-Executive Director of GO Michael O’Loughlin said the grant would directly fund the expansion of their scholarship program to include state schools.